I’m a stay at home mom. I’m not an especially good house wife though. I shun most domestic duties. I figure that if my family are fed tasty healthy food, and everyone and their clothes are clean, then I’ve done a pretty good job. Please don’t look under the beds. I don’t recall the last time I passed a broom down there. The truth is, if you find me cleaning frantically, I’m probably expecting company or I’m crazy mad. So what the heck do I do all day? I volunteer at my son’s school. A lot. I help with the new in-classroom breakfast program. I make copies, correct papers, laminate stuff, gossip, etc. Lately, I’ve been pulling groups of students to work on art projects. I like being at school. I know the teachers and administrators. I know how my son is doing academically and socially. They get free labor and I get the inside scoop. It’s a good deal. My son’s teacher last year was on the garden committee. His class would go out to the garden once a week and I would volunteer to help out. 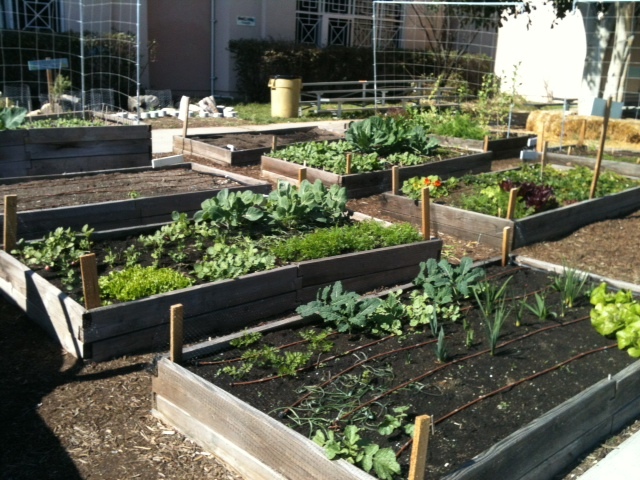 I quickly realized that the teachers had too much on their plate to properly plan and maintain the school garden. 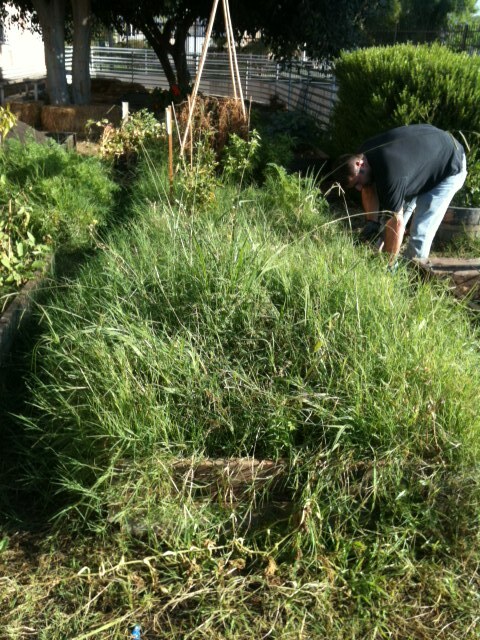 The boxes were overgrown with crab grass. The kids would try pulling it out but it just grew back with more vigor. The drip lines were all out of whack. Some boxes were bone dry while others drowned the plants. The outings were sometimes chaotic because the teachers did not have time to plan the outside activities. I’m going to blame standardized testing for that. Did you know that LAUSD does mini tests to see how kids are going to do on the big standardized test? They do this 3 times a year. I see it as wasted instructional time. Anyways, I slowly started taking on more responsibility until I became the Garden Lady. With the help of my trusty sidekick, Juancho Pansa, we dismantled, sifted, weeded, mulched, repaired, trellised, and trimmed that garden into shape. My dad helped fix the faulty drip line system. Now I give mini gardening lessons in the classrooms and plan a lot of the planting. I try to come up with ways of making the garden beautiful as well. We made a scarecrow and garden signs. I think it’s important that the students have a sense of ownership and pride. They love picking their veggies and they really do eat them. I’ve seen it with my own eyes. Like me, these kids are city kids. Many live in apartments and don’t have opportunities to grow any kind of garden. In school they get a hands on opportunity to learn about growing food. Last year only 3 classrooms worked in the garden. 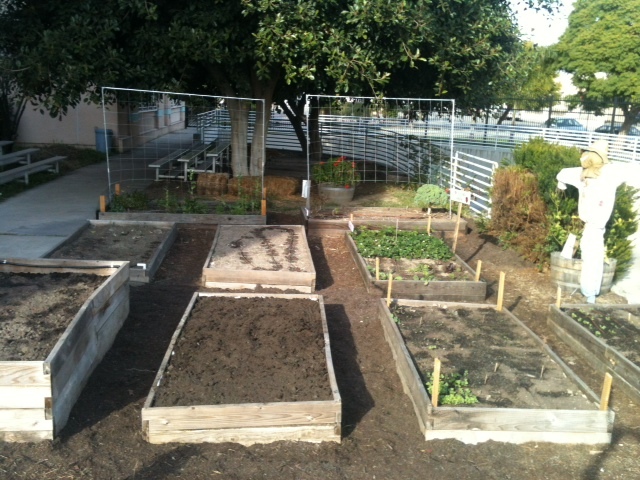 This year all 9 garden beds will be used by 8 different teachers. Picture of all beds weeded and all paths mulched in January. Picture of boxes February 25. All but 2 garden boxes planted with maturing winter veggies. So what am I trying to say (other than look how awesome I am)? I’m not a good housewife, but I have interests and talents that have value. I don’t really have a green thumb. I have a computer, time to look stuff up, and people that are willing to help me. I have found a way to be helpful while totally doing what I enjoy. I think everyone is good at something. If you could share that talent with others then please do so. If you could do it in a classroom then your kids will be the beneficiaries of your good deeds. If you don’t have kids then find a different way to help and please stay out of the schools because that’s just creepy and illegal. Aha! You are getting good at this blogging thing ! You are one of the Super Moms I know. Ok, I love this. Sending good garden vibes from another like-hearted mom, working away at my kids’ public school. Blessing on you!